The upcoming Revolt electric motorcycle has been spied first time under camouflage. The official design sketches of the same have just been revealed. Earlier this week, we got to know that a new electric motorcycle is going to launch soon in India. 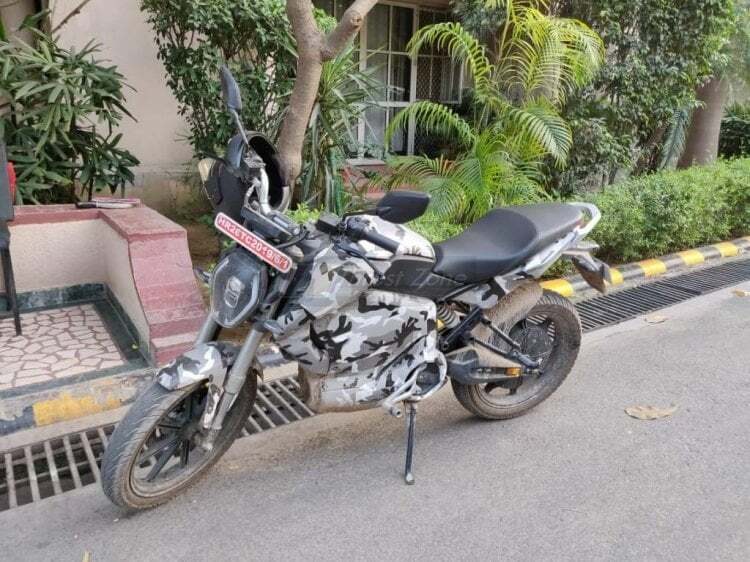 Gurgaon-based Revolt Motors is launching the bike in June 2019, which will be the very first one in India. At that time, there was no idea of how the motorcycle will look. No design sketches, no spying and no renders have come up. But now, the spy shot of it covered under camouflage has come up. 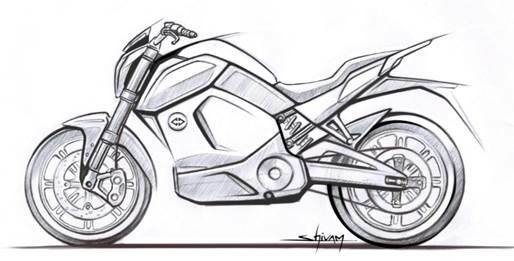 The first official design sketch of the motorcycle has also been released. It looks like a naked sporty commuter, similar to what the FZ-S and Apache RTR 160 4V look. At the front, a tall hexagonal headlamp is fitted which comes with vertically stacked lights and surrounding LED DRLs. A fully digital instrument console sits above the number plate, above the lights. The design seems to be simple, as the Revolt E-motorcycle is focused for the mass-market. It gets a single step-up seat with a silver pillion grab rail. The bike gets a single-piece handlebar and the ignition key placed on the fuel tank. For suspension purposes, the bike uses USD Forks at the front and a monoshock absorber at the back. For braking, we suspect disc brakes at both the ends. However, in this spy shot, a disc at the front can only be spotted. For further safety, it will use ABS as a standard fitment. The Revolt Electric motorcycle will be India’s first AI-enabled bike. The bike will come with battery-management system and Electronic Control Unit. The console will display GPS navigation, riding range and much more. The bike will offer a riding range of over 150 kms. The top speed achievable will stand at 85 km/hr, equivalent to a 125cc motorcycle. It will be first launched in Delhi NCR, where the company is planning to install many charging stations.